The squash are blooming in the garden. I think we have just about got everything back to "normal" after the team left. Right after they left, I stopped by the doctor and had an x-ray for what I thought was a broken rib. I was elbowed in one of the games the week prior and it suddenly was more painful. Thankfully it was just bruised cartilage and nothing was broken. It was irritated by the constant use and is feeling much better now. Saturday we got a call from a friend in Paris, the wife of the man who translated for AC Green, she had passed out at work and was having tests to find out why, ended up being a heart problem and the doctors said it would be could if someone could stay with her the next week while they waited for the results of the test. Angie decided she should go and help out. She left on the TGV Monday and spent the week in Paris. Meanwhile it was me and the kids back home. Look out! Things went well. It was busy but no problems. Tuesday I ran errands, shopping and the bank. I also finished gathering all the paperwork for Caleb's entrance into Junior High. Lilia left Wednesday morning for her end of school trip. 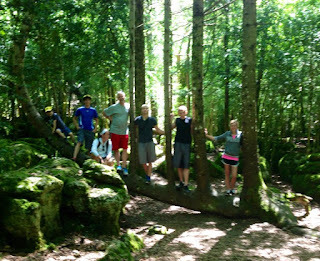 They left the school by bike and rode 24 km to camp near a lake for a couple of days. She had a great time. Wednesday, Andrew had his birthday party at McDonalds. It was during the team's visit, but since we didn't really have time to properly celebrate it, we decided to give him the McDonald's birthday experience. I stayed for the party, which he really enjoyed with 7 of his friends. Thursday I got all the paperwork turned in for Caleb. And after school we went to the store to let Andrew spend his birthday money. Friday evening I picked up Lilia, and Saturday morning we picked up Angie at the airport, she took a flight back from Paris to Toulouse. Angie getting hugs at the airport. The last few days of May were spent preparing for the basketball team that we had arriving on Sunday morning. There were sleeping arrangements to consider, food to buy, errands to run, and on top of that all our regular activities. Sunday morning I left early to get the team. I left at 5 am Sunday morning to drive to Barcelona to pick up the team. Lilia went with me because I wanted some company and she really wanted to meet everyone. We met them at the airport and had a good three hour ride back to Villasavary to attend the anniversary picnic of the church in Carcassonne. 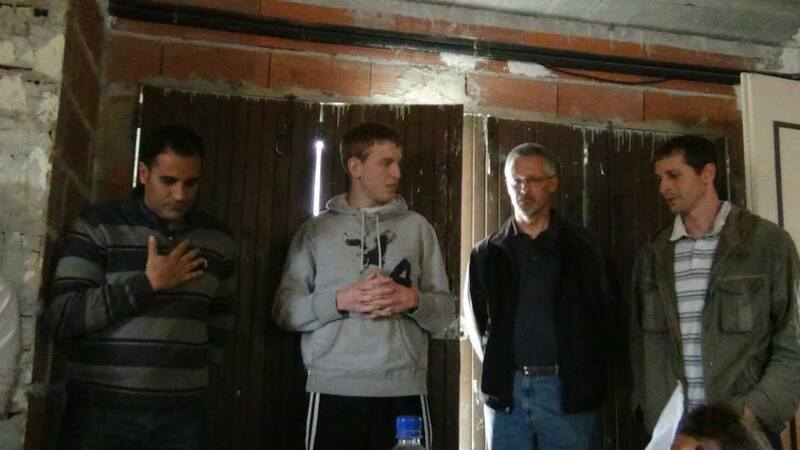 Pictured above, I am translating the testimony of two of the team members. After the picnic, we headed to our house for let everyone contact home, and then went to the gymn for a little practice. 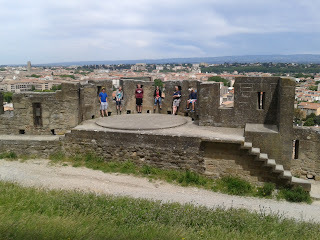 We all had McDonalds together and then headed to Carcassonne to the house where they would be staying. 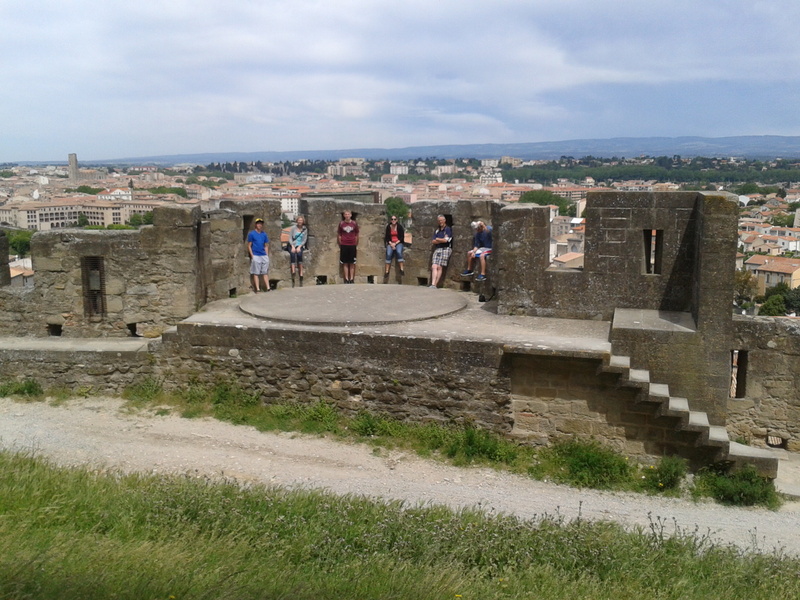 Monday, the team slowly arose and we toured the Walled City of Carcassonne. We enjoyed walking around Carcassonne, tried out some local food for lunch, shopped a little, and headed to our game in Sigean. Sigean was ranked #1 in our area, and so it would be a tough game. We ended up loosing, but did well, considering jet lag, and it being our first time to play together. It was what happened after the match that was great. There was a large crowd there, and they offered food and drinks afterwards. It was great, we had the chance to talk with the other team, minglem play with the kids that were present. I knew at that moment, that this whole idea was going to be worth the time and expense put into it. We had some good conversations over the course of the evening. Tuesday, we went to the beach, while the weather was good. It had been cold before the team arrived, but temperatures were in the upper 70's for most of the time they were here. 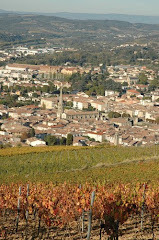 Tuesday evening, we played Sud-minervois, pictured above. We had a great time again. And this time we won. We actually played 5 quarters. The great moment was when one of the refs bowed to Rachel as she hit her 7th three-pointer of the night. Once again, we had a real good time afterwards visiting with everyone. My family was there and so we had plenty of translators. 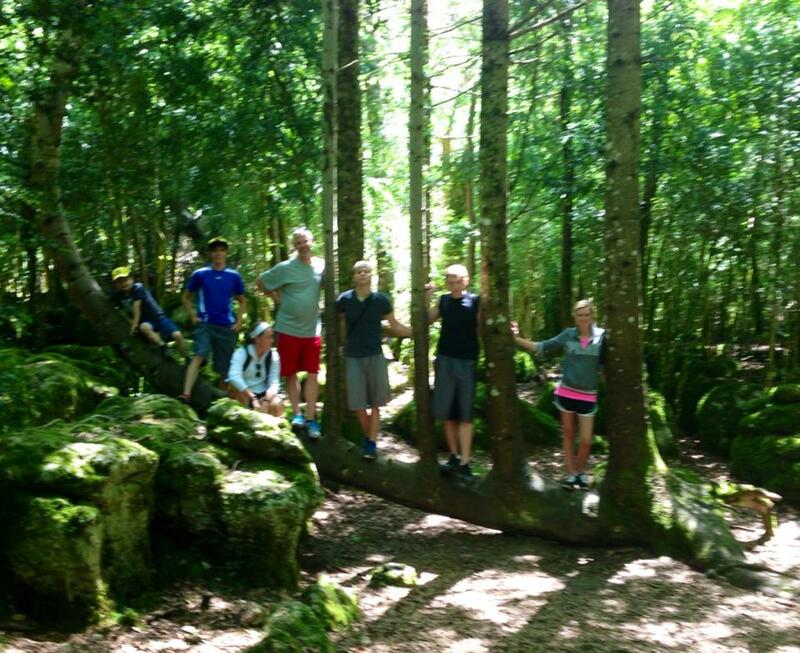 Wednesday was Andrews birthday so we took him along with us to hike through the green Labyrinthe. It was a good time to spend with the team and Andrew enjoyed the special moment for his 7th birthday. 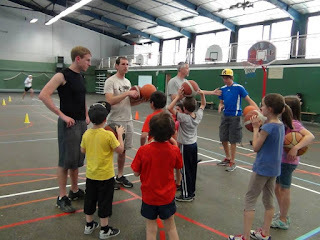 That afternoon we had basketball practice with the team that I coach. It was a great time, the team had no problems communication enough to get their ideas across, and all the kids present were really happy with the whole experience. Wednesday night, we played at Villeneuve, a good game that we won, and one of the highlights of the trip. We stayed for over an hour after the game visiting and enjoying the food. One of the team members was a resaurant owner, and invited us to eat in his restaurant the next day for lunch. It was a great time of getting the know them, and building relationships. During the lunch meal, I sat nexted to one of the other team members who did not speak english, and had a good converstation with him about religion. One of our players, Russell, signs a shirt after the game. We were able to meet some people several times. Thursday afternoon, I went to pick up AC from the airport in Toulouse. We stopped by his bed and breakfast and had a proper French meal all together. 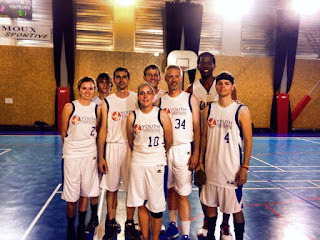 We finished up a little late, but made it to Limoux in time to have a short scrimmage with the Limoux guys. They were real surprised to see AC Green there because I had not told them he would be arriving then. We had a good time, and they enjoyed getting some pictures and autographs one on one with AC. 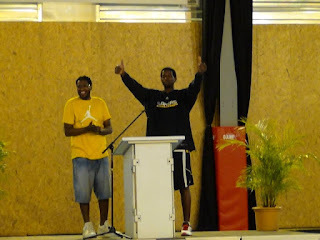 Friday, we had our usual morning devotion time, with AC Green, as a guest speaker. He gave each of the team members one of his books. We then headed of to the market, where I set up the stand as usual, and the group paraded around the market meeting people and inviting them to hear AC Green speak. THe morning went well. and we had lunch at our house, and greeted our translator Yvain, and his family, soon afterwards. We had a good fellowship time. 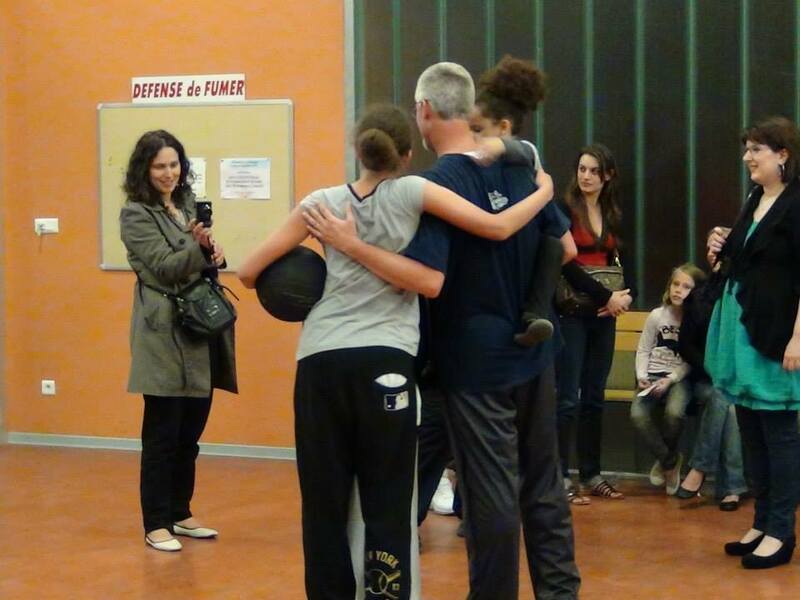 We headed out for our game in Coursan, and stopped by the annual basketball association meeting to turn in the paperwork for our Limoux team and present AC Green to everyone present. We played a good game against Coursan, they brought their two teams together and had a good team. Sadly one of their players dislocated his knee during the game (severly), and we had a long pause as we waited for the ambulance. We finished the game, and once again had a long visit afterwards. The team and AC learned to play Petanque, a French game a cross between bowling and horseshoes. Saturday was the big day. AC Green decided to spend the day resting and preparing for that evening. The team and I helped one of our bible study ladies move into her new apartment. I had helped her with the big stuff the last couple of Saturdays before and she just needed help with bags and boxes mostly. 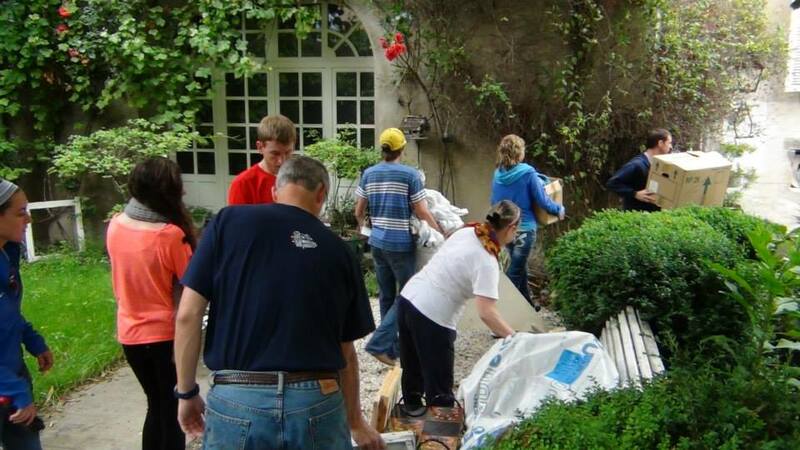 We got finished up in no time with all the helping hands had lunch with friends. The evening started at 6 pm. We went and got AC Green and were there by 5:30. About 250 people showed up, including the mayor. 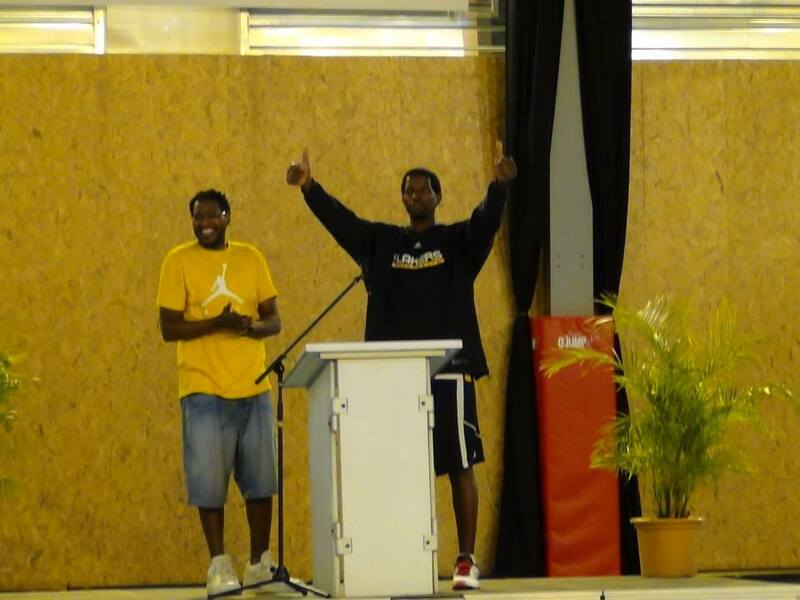 AC Green (shown above with Yvain) did a great job communicating with the audience. He took questions and shared some good stories and good moral lessons. Everyone enjoyed it and was impressed with his approachability and humility. 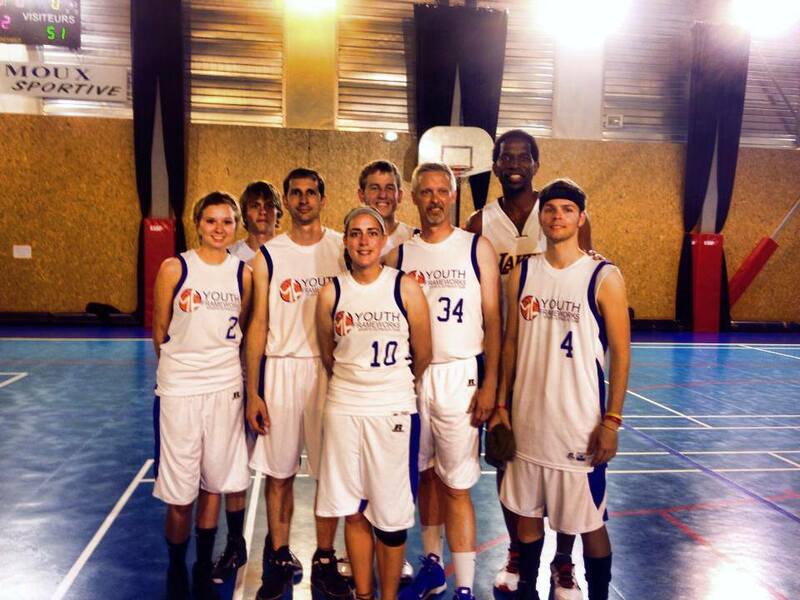 We finished up his time at about 7:15, cleared the stage and had our official game against my Limoux team. I played with the US team. It was a good match, we won by just three points. Afterwards, the game, there were signatures and pictures with AC, and we enjoyed some fingerfoods provided by the mayor. Afterwards the two teams went to McDonalds. AC actually rode with and Limoux player in a Twingo (small car). We had a good time at McDonalds talking and snacking. AC Green gave me the jersey he was wearing, and I gave him mine, signed by the team. After dropping everyone off, I came home and visit more with Yvain and his wife, we hadn't seen eachother in a couple of years and so it was nice to catch up. I grabbed a couple hours of sleep before leaving to take AC Green back to the airport. I made it back in time to get the team and head to church. After the services, we attended the year end kids basketball tournament. We had a good time. The boys loved having the team cheer them on and the team was able to see several of the people they had met previously. I gave the team the night off, while I went home and caught up on soem sleep. I slept a good 12 hours and picked the team up monday to see the Gorges of Galumus and the Castle of Queribus (picture below). 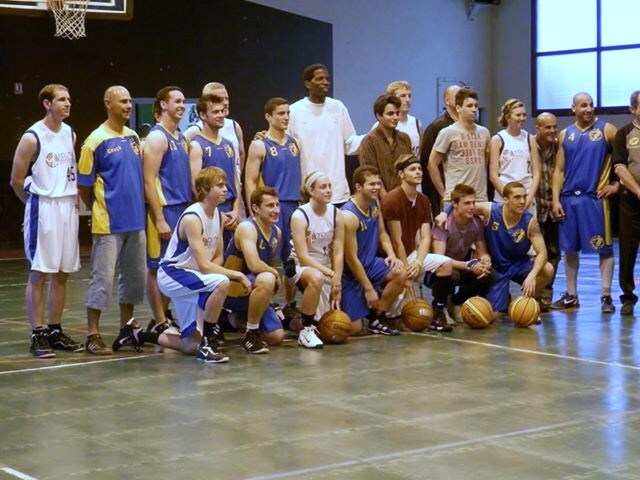 Afterwards we had a friendly game with players from several different teams. 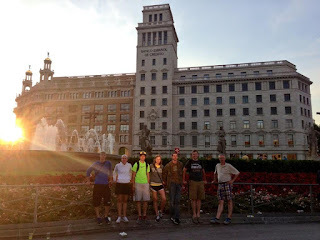 Wednesday morning we headed back to Barcelona, via Andorra. Which still had snow. 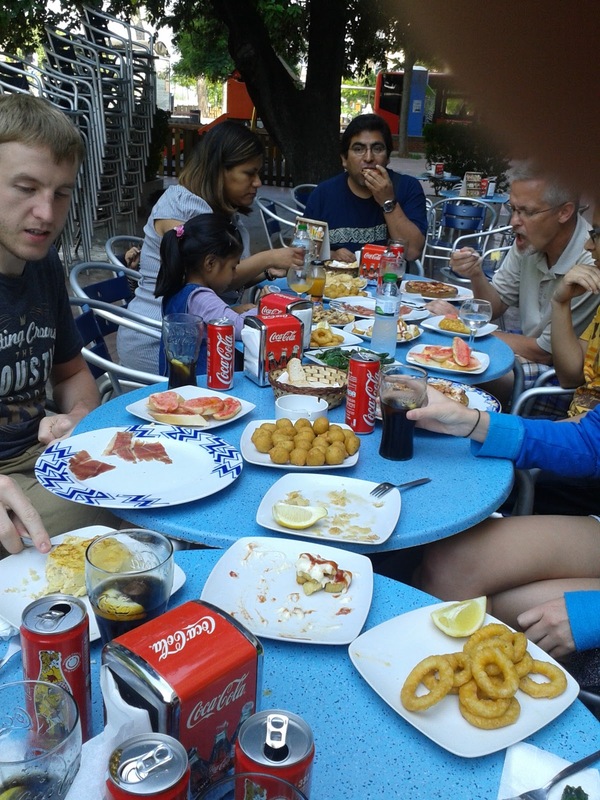 We had lunch in Barcelona with our pastor friend, Bro Morales and his family. We then did some site seeing before hitting McD's and then the hotel.